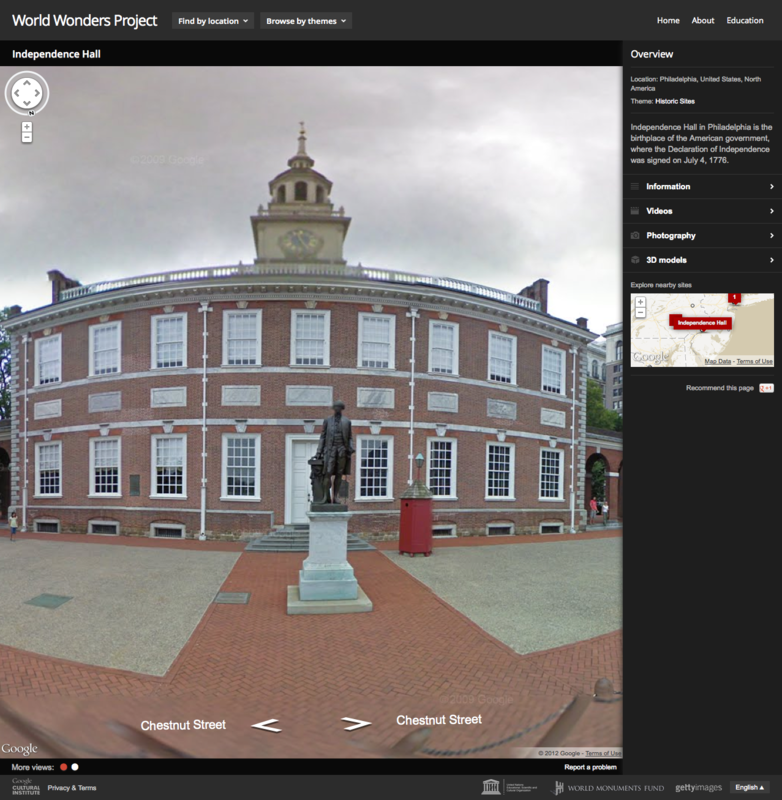 Independence Hall in Google World Wonders. To protect the statue’s identity, his face has been blurred! Google recently launched its World Wonders Project, an edited compilation of world heritage sites using its Street View technology to “bring to life the wonders of the modern and ancient world.” If you’re not already familiar with Street View, it allows you to navigate Google Maps through 360-degree images so you can look left, right, up, and down. At present, they’ve assembled 132 sites from 18 countries, including Stonehenge, Pompeii, Versailles, and Himeji Castle. Sites are organized by location and theme, and each site features a large navigable photo with a map and a slide-out window of information, video, and photographs. The World Wonders Project also includes education packages for primary and secondary levels that are linked to specific “wonders,” such as “liberty and the US declaration of independence” for Independence Hall. These are large zipped files, so I didn’t investigate them. This entry was posted in Historical interpretation, Technology and tagged Google Cultural Institute, Google+, World Wonders Project on June 7, 2012 by Max van Balgooy.